​Success is not just a measure of how big you can DREAM.....It is also a measure of how much you can DO. 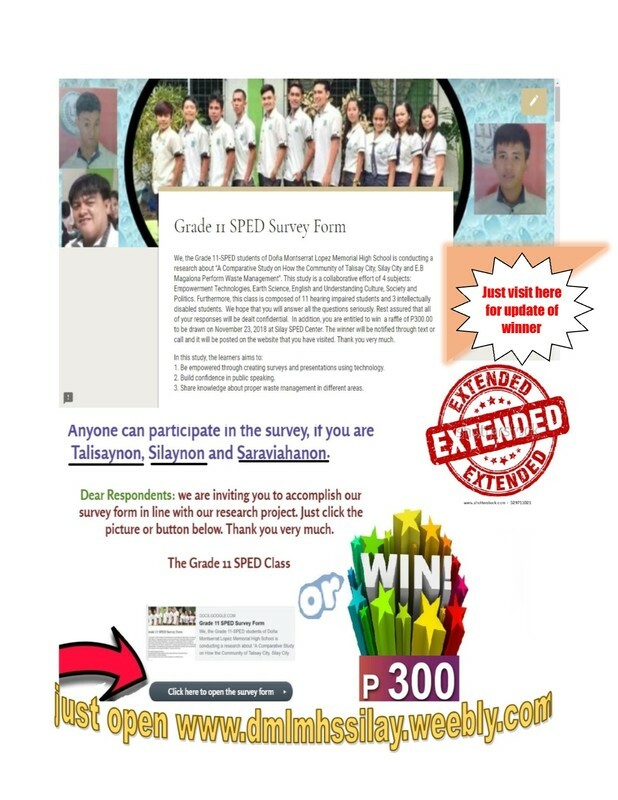 ​Anyone can participate in the survey, if you are Talisaynon, Silaynon and Saraviahanon. Dear Respondents: we are inviting you to accomplish our survey form in line with our research project. Just click the picture or button below. You are entitled to win a raffle of P300.00 to be drawn on November 23, 2018 at Silay SPED Center. The winner will be notified through text or call and it will be posted on the website that you have visited. Thank you very much. 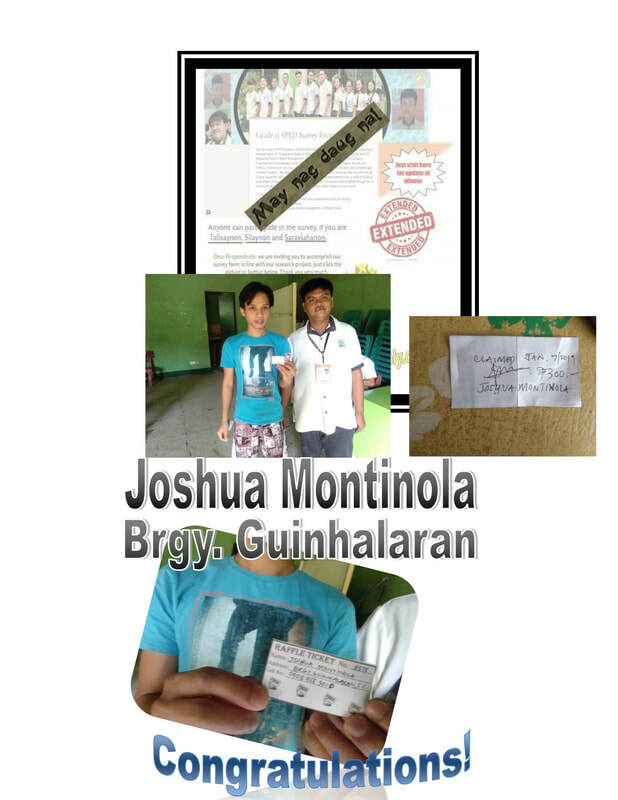 Attention: Now we have already the winner of P300.00 just watch the video"
Personal Development is one of the subjects in the Senior High School Curriculum. Here you will see the video played by my students. It depicts the typical family problems, common situation shall we say that exists in the family during the difficult times. This subject is being played by 2 groups of which the first group played about the family how the parents handle the 'black sheep" son(Jason) in the family made his performance when he robbed his mother's money given by the husband who worked as a teacher. In a typical Filipino family when a father gets angry with the son who made mistakes tends to let his son leave the house and never come back. but when the son asks forgiveness the whole family will talk together and the father will talk to his son as a real father, in the end both will reconcile and return to its normal state. This is how (Jason) being a "black sheep" handled the situation during his adolescent stage. This is how they portray their subject in Personal Development about self-exploration, discover things to handle behavior, attitude towards maturity. Sound discovery of self gives them for having a wise decision and have a good work ethics in the future at the same time leaving them a good and responsible parenting. Let's see the 2nd group next meeting they will play in a classroom setup. It is interesting to note that these students with special needs can relate what normal students are facing in this modern times. Really, disability is not a hindrance but a challenge for what they can do only we will give them a chance to show off. As mentioned on the previous post, next group will perform another drama, this is it. But this time, they will play a situation with a common problem in the classroom. The drama is composed of two characters, a teacher and the students. One student (Sherlyn) is a victim of bullying. She is being bullied by her classmate (Joseph) who is playing the role of a gay student. A teacher came in the set, showing his face being overwhelmed by this situation. The teacher has a vital role to control everything and to settle the harsh things among students that have been through. The teacher found out that the root cause is uncontrolled gossip that has spread all over. The teacher is also taking the role of a guidance counselor to talk about the solution of the problem. In the end, the two students have finally come to reconciliation and both became friends again. This is how 2nd group portray the self-exploration in their Personal Development subject. Is there something that you should know?